Disney World comes alive during the Christmas Season! To the Jones Family, this is the most magical time of year at Disney World! You can enjoy an amazing light and fireworks display at Disney’s Hollywood Studios. You can watch Goofy Santa as he makes his way down Main Street USA, for the Mickey’s Very Merry Christmas Party. You can even see your favorite actor recite the story of Christmas at Epcot. A Disney World Christmas is extra magical! Discover all the Christmas magic of old Hollywood at Disney’s Hollywood Studios at the Walt Disney World Resort. Disney’s Hollywood Studios is decorated for the Christmas Season in the typical Hollywood style. Each section of the park is decorated with greenery, lights, and festive ornaments. The highlight for the holidays is the new Jingle Bell Jingle BAM fireworks show. BAM perfectly explains this show! There is music, projections, lasers and fireworks; all themed after the cute holiday special called Prep and Landing. It is a super cute show! ❄️ Elsa Snowflake Tip: You can purchase Glow With the Show Mickey Mouse ears or Minnie Mouse headbands. These ears will light up to the music and show! It is amazing! These ears can be bought at Disney’s Hollywood Studios. Epcot at the Walt Disney World Resort is extra magical this time of year! Both Future World and World Showcase (which are the two sections of Epcot) are decorated for the Holidays. The Future World is decorated with lots of greenery, lights and futuristic decorations. Moving into World Showcase, each country is decorated for the Holidays Around the World. The decorations are based on the typical decorations from that country. It is a great way to learn about other countries and cultures. Many of these countries even have entertainment based on their celebrations of the seasons including storytellers and Disney Characters. The most popular entertainment at Epcot for the season is the Candlelight Processional in the American Adventure. This amazing show is included with your paid admission into Epcot. This show starts off with hundreds of singers with candles walking into the theater. It is just beautiful. There is even a 50 piece orchestra. During the show, there is a celebrity that reads the story of Christmas. During the show, there are lots of beautiful songs. It is one of the most popular shows during the Holiday Season. Since it is so popular, seating fills up quickly. Plan on arriving to the designated line in the American Adventure at least 1 hour prior to showtime. You do not have to sit in the theater to get a great view. Most locals find a spot to sit outside of the theater, along the white gate. This way, you can grab a quick dinner and then just sit and wait for the show instead of standing in an hour line to maybe or maybe not get a seat. There are several show times each evening. For the Holiday Season, be sure to enjoy the beauty of the Candlelight Processional and the Holidays Around The World at Epcot. ❄️ Elsa Snowflake Tip: To save time, you can book a Candlelight Processional Show Package that includes dinner at one of the World Showcase restaurants and preferred seating for this show. The preferred seating is a free perk, when you book this package! Magic Kingdom is one of the most popular parks for the holidays with sparkling decorations; including colorful ornaments, greenery, and even snow. Yes, is does snow in Florida! You can enjoy all of the beautiful decorations, but to really get into the Christmas Spirit, you have to attend the special event called Mickey’s Very Merry Christmas Party. This special event party is held on select nights through mid-December. During this party, you can enjoy many of the regular Magic Kingdom rides and attractions. Plus, you will have some other special activities including Mickey’s Once Upon a Christmastime Parade, Holiday Wishes fireworks, snow on Main Street USA, Disney Characters in their holiday best attire, lots of sweet treats, and so much more. You can even purchase special souvenirs from this special event. We have been attending this event for over 10 years. It is one of those special events that really gets your family in the Christmas spirit. We highly recommend this special event for your family. The evening kicks off at 7 p.m. and continues until midnight. ❄️ Elsa Snowflake Tip: You can arrive as early as 4:00 p.m and get some extra free time to play before the special event starts at 7 p.m. When daylight has passed during the holiday season, Magic Kingdom guests can behold a breathtaking transformation during the Castle Dream Lights ceremony. Anna, Elsa, and some of your favorite Frozen characters take to the stage and magically transform Cinderella Castle into an ice palace aglow with 200,000 white lights. Be sure to laugh and laugh some more as the skippers bring some holiday cheer to the Jungle Cruise. During this time of year, the Jungle Cruise turns into the Jingle Cruise. The skippers get home sick and decide to decorate and celebrate Christmas in their own way. 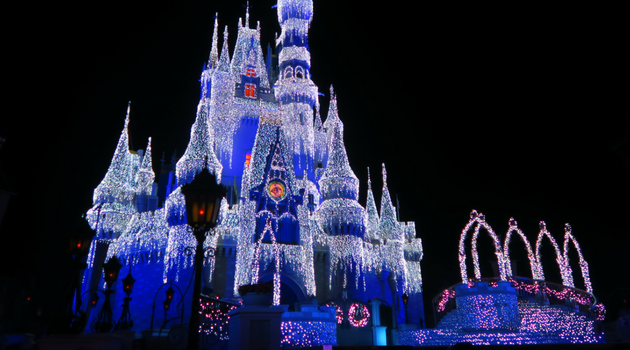 It is a fun transformation at Magic Kingdom during the holiday season. Disney Springs also celebrates the Christmas Season with meet and greets with Santa, live entertainment, beautiful decorations, and a brand new drone show. For pictures with Santa, you can either use your own camera or the Disney Photographer can take pictures for PhotoPass. Since Santa is so popular, there may be longer waits. The good news, you do not have to wait in the long lines. You will check in with a Disney Cast Member. They will give you a pager. You can then dine, go shopping, or enjoy other holiday attractions. When your pager goes off, you pop back over to Santa for a less than 10 minute wait to meet the big guy! Besides Santa and live entertainment, you may want to hit the train for younger kids or the carousel for everyone else. To pick up your favorite Christmas souvenirs, stop by the Disney Christmas store to get an ornament, stocking, or just a fun Disney holiday souvenir. Don’t forget all of the great shopping around Disney Springs, including the 12 Days of Christmas store at the Disney Springs Marketplace. Disney Springs has several fun holiday activities and shows. One of the activities is the Tree Trail. You wander through decorated trees themed after your favorite Disney rides, shows, and movies. Our favorite is the Alice in Wonderland tree with the Cheshire Cat, Mad Hatter, and Alice touches. These trees are truly spectacular. You may even find yourself wandering through snow! 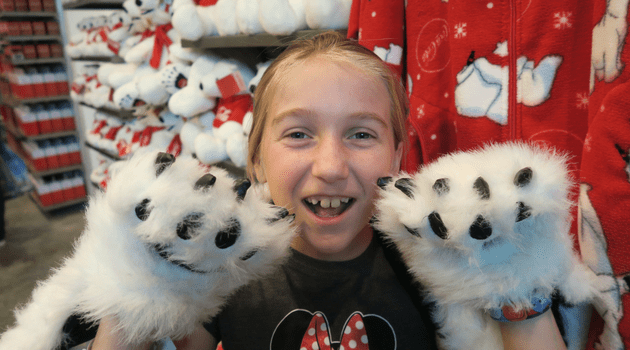 With all of these exciting new holiday activities, Disney Springs is now one of our favorite ways to kick off the holiday season. Disney Springs is free, so all of this holiday fun is no cost to you! ❄️ Elsa Snowflake Tip: This Santa is one of the best Santa’s in Orlando! For my family, this is the Santa we visit each year, as Orlando locals. The Walt Disney World Resorts even get into the Christmas spirit! All of the Disney World Resorts decorate with the theme of the resort. There are a few Disney Resorts that are extra special including Disney’s Grand Floridian Resort and Disney’s Yacht & Beach Club Resorts. These three resorts add a little extra magic to their decorations. 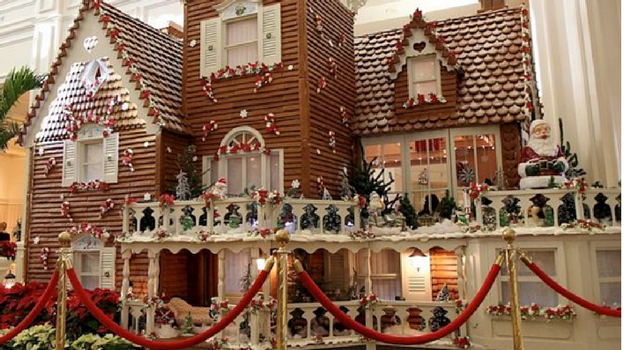 Disney’s Grand Floridian Resort features a 16 foot gingerbread house! As you walk into the lobby of Disney’s Grand Floridian Resort you can smell the sweet gingerbread and notice the amazing house. This house is made with 800 pounds of flour and 600 pounds of sugar. You can walk around the Gingerbread House and even purchase Gingerbread Cookies. The sell the cookies inside the Gingerbread House. It is an amazing site for all holiday seekers. Disney’s Yacht & Beach Club Resorts features extra fun decorations for the holidays. Disney’s Yacht Club Resort has a holiday train display. Adults and children can spend hours watching the trains move around the holiday display. If you want to smell more gingerbread, walk over to Disney’s Beach Club Resort to see the carousel made completely of gingerbread. You can even spot “hidden Mickeys” on the Gingerbread Carousel. 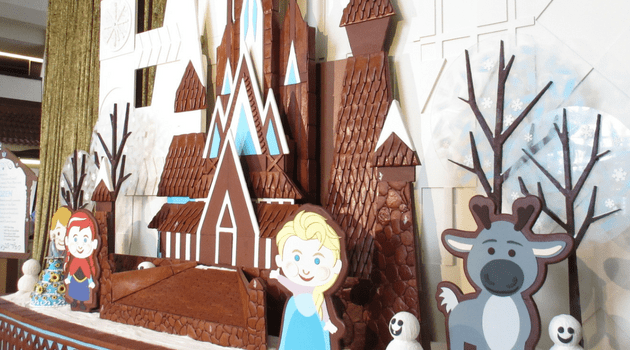 You will be mesmerized by the Frozen gingerbread world at Disney’s Contemporary Resort. This 17 foot tall ice castle is all made with tasty treats. You can see your favorite Frozen characters and even purchase a few sweet treats to take home with you. ❄️ Elsa Snowflake Tip: It is free to visit these Disney Resorts to see these displays. Many guests will come to Disney World and just spend an evening visiting these Christmas displays at the resorts. There is no fee to park, so head over to these Disney Resort hotels to see these incredible displays and enjoy the holiday magic. Take an old fashioned horse drawn sleigh ride at Disney’s Fort Wilderness Resort. This fun family ride will take you around Disney’s Fort Wilderness, including some of the decorated campsites. Many of the guests staying at the campsites go all out on their Christmas decorations. It is a fun holiday event for the whole family. You can enjoy some recreational activities at Walt Disney World filled with Christmas cheer. 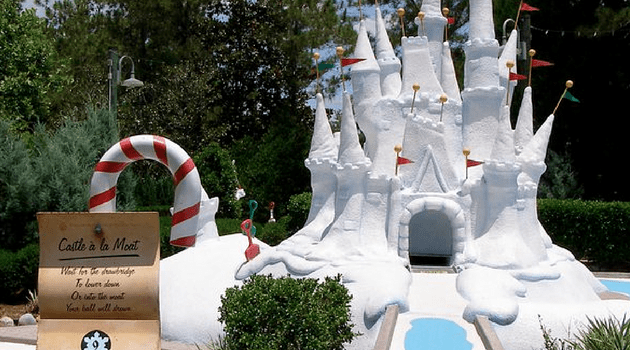 Disney has a miniature golf course called Winter Summerland. The whole golf course is themed after Santa Claus and Christmas. There are two golf courses to choose from including winter or summer. Both are themed with Christmas elves, snowmen, Mickey Mouse, Goofy, and even Santa. They are great fun for an afternoon or evening of Christmas fun! ❄️ Elsa Snowflake Tip: If you booked a package through Disney, you will get free coupons in your documents to enjoy a Disney Miniature Golf Course. You can use those coupons on Winter Summerland! In Florida, we may decorate our palm trees with Christmas lights but we still have snow and ice! There are many activities outside of the Walt Disney World Resort for more holiday fun. 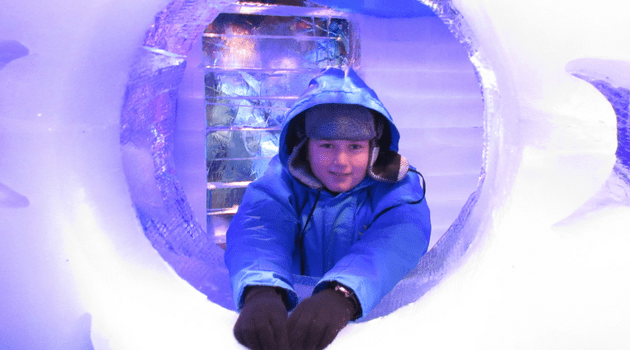 When you think of Florida, I am sure you do not think of ice, but Gaylord Palms (right down the road from the Walt Disney World Resort) has tons of ice. They have a special attraction called ICE! You will be given a huge overcoat to wander through rooms all themed after Christmas Around the World. Two million pounds of ice are carved to create this masterpiece experience. In addition to ICE, Gaylord Palms has lot of extra fun including Gingerbread Decorating, Elf on the Shelf Scavenger Hunt, Charlie Brown Character Breakfast, Cookies with Mrs. Claus, and much more. SeaWorld Park brings Christmas to Orlando with their popular Sea of Trees! This display is a local favorite with over 100 trees that sparkles to music and lights up the water. SeaWorld’s Christmas Celebration is one of our favorite holiday traditions in Orlando. It is a must see! ❄️ Elsa Snowflake Tip: This amazing event at Sea World is FREE with your paid admission. For holiday events, it is a great value to have holiday fun for no additional cost. Remember, if you buy a 1-Day Pass to Sea World, your second day is free. You can enjoy two days of Sea World’s Christmas Celebration! Less than 15 minutes down the road is the Universal Orlando Resort. One of our favorite holiday activities is the Macy’s Holiday Parade at Universal Studios. Did you grow up watching the Macy’s Thanksgiving Day Parade? You can see some of these same balloons at Universal Studios for their special holiday parade. Christmas for our family starts with the Macy’s Holiday Parade at Universal Studios. ❄️ Elsa Snowflake Tip: Grab a cup of hot chocolate, coffee from Starbuck’s, or a Butterbeer from Wizarding World of Harry Potter and grab a seat for the Macy’s Holiday Parade. Right outside Starbuck’s is one of the best spots to see this parade, without the crowds at the front of the park. If you are feeling a little like the Grinch, you may want to head over to Islands of Adventure. You can meet the Grinch or watch the popular THE GRINCHMAS Who-liday Spectacular show. This holiday fun will make even the Grinch’s heart grow! There are so many magical activities to enjoy over the Christmas holidays at Disney World and Orlando. Add a little extra cheer to your vacation with these fun-filled activities from Christmas lights at Disney’s Hollywood Studios to mini-golf at Winter Summerland. 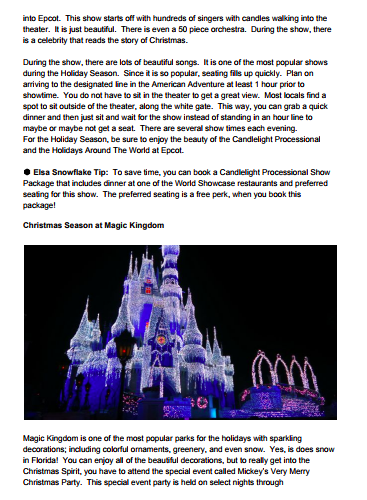 Download 9 pages of holiday fun with the Guide to Christmas at Disney World! What is your favorite holiday activity at Disney World or Orlando? Leave a comment below!